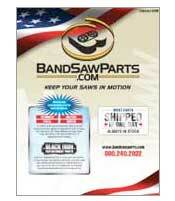 We are a Hem Saw replacement blade guide manufacturer. These are some of the best aftermarket blade guides in the sawing industry. Our product is made to the highest standards; from start to finish. We start with machining the backings on a precision CNC mill. Then, we apply the carbide with an induction heater to ensure correct bonding of the carbide to the backings. All guides are finished, ground and painted to prevent rust. Our first priority at BandSawParts.com is quality Hem parts. We only stock items of premium quality. Hem saw blade gudes are made right here in the USA with good ol’ American know-how. Hem saw guides like A-10175-11 or A-10175-10 are available for you. Hem® is a trademark of Hem Manufacturing Company, Inc.
1" Carbide Blade Guides Fits Machines: sidewinder (all models),HEM Saw H90, H100 Steel Backing with carbide soldered on. Guides are sold as a Matched set of 4 Guides. Fits HEM 1200 (all models),HEM Saw H101 (all models), Cyclone (all models), HEM Saw V100 LM2. LM3, LA4, and all Hydraulic vertical saws. Guides are sold as a Matched set of 4 Guides. Fits Machines HEM Saw H105 (all models), H120 (all models) Guides are sold as a Matched set of 4 Guides. Fits HEM Saw machine 1400 (1 1/2 band), 1500 Carbide has ground finish. Guides are sold as a Matched set of 4 Guides. Side Guides For machines HEM Saw H-130 (all models), WF130 (all models).These Guides hold the Sawblade straight & perpindicular to saw base. Guides are sold as a Matched set of 4 Guides. Fits all 2000 machines with 2" band (Set of 4)*. Guides are sold as a Matched set of 4 Guides. Fits Machines HEM Saw H160 (all models), HEM Saw H190 (all models), H3236 (all models), Ct200 (all models), WF140 (all models), WF160 (all models), WF 190 (all models). Guides are sold as a Matched set of 4 Guides. Lead in Rollers for the CT-2000 series of band saws. These rollers help to relieve the twist action of the blade running from the wheel to the blade guides. This will significantly increase blade life on the machine. Fits HEM Saw DC40 and all other machines with the exception of models 2000-60. Guides are sold as a Matched set of 4 Guides. Backup guide for HEM Saw 1500 1 1/2 " band. This guide rides on the back of the sawblade, supporting the blade during cutting. P HEM A-10175 10. This guide rides on the back of the sawblade, supporting the blade during cutting. P HEM A-10175-11. This guide rides on the back of the sawblade, supporting the blade during cutting. P HEM A-11865-4. This Guide Assembly acts as "Back Up" guide dampening vibration. Used on Hem Model # V-100LMS. Blade Cushion V-100 Lm3. This assembly acts as "Back Up" guide dampering vibration. Carbide Guide for H-750 3/4" and V-100 lower back-up guide This guide rides on the back of the saw blade, supporting the blade during cutting. Top Carbide Guide for machine the use 1" and 1 1/4" band. This guide rides on the back of the saw blade, supporting the blade during cutting. P50-4 Bronze Bearing* Two of these bearings are used to support adjustable guide arm shaft part # A-9435-0-1-0. Motor for Adj. Guide Arm* This Gear Motor is used on HEMSAW Models equiped with Electric Guide Arm Adjustment. P HEM B-9293-J. These Guides and Clamps hold the "Floating" Side Guide and Mount on Outside bottom of Guide Arms. This is the Outter Guide Cap Assembly that is mounted on the Adjustable Guide Arm, holding the "floating" Blade Guide in position..
P HEM B-9294-K. This is the Outter Guide Cap Assembly that is mounted on the Fixed Guide Arm, holding the "floating" Blade Guide in position. P HEM C-10149-D. This is the Outter Guide Cap Assembly that is mounted on the Fixed Guide Arm, holding the "floating" Blade Guide in position. P HEM C-10150-D. This is the Outter Guide Cap Assembly that is mounted on the adjustable Guide Arm, holding the "floating" Blade Guide in position. P HEM C-10582. This is the Inner Guide Mount Assembly for the Fixed Guide Arm. P HEM C-10584: Adjustable Guide Clamp. This is the Inner Guide Mount Assembly for the Adjustable Guide Arm. P HEM D-10582-5-1 This is the Inner Guide Mount Assembly for the Fixed Guide Arm. P HEM D-10582-5-2 This is the Outter Guide Cap Assembly that is mounted on the fixed guide Arm, holding the "floating" Blade Guide in position. P HEM D-10584-5-1 Adjustable Guide Clamp. This is the Inner Guide Mount Assembly for the Adjustable Guide Arm. P HEM D-10584-5-2 This is the Outter Guide Cap Assembly that is mounted on the adjustable guide arm, holding the "floating" Blade Guide in position.